A getaway to Montreal for a weekend of fun or relaxation can include big events, hot festivals, fine dining or a relaxing spa experience. No matter what the season, Montreal has a slew of things going on during the weekends. Plan your weekend getaway with hotel ideas, restaurant tips and places to go for great music and cultural experiences. Put Montreal on your weekend getaway calendar and find out what's going on this weekend. Montreal has some fantastic places you can call home base during your weekend getaway. If you want to feel like you woke up in Europe, then book a room at one of these Old Montreal hotels. Old Montreal—or, as it’s more commonly referred to, Vieux-Montreal—once encircled by thick stone walls and backdropped by the scenic Saint Lawrence River. Today, you'll find a charming historic area with winding cobblestone streets, grand Gothic architecture, and old-world squares. There are some excellent hotels, ideal for a weekend with a European feel. In winter, there are specific hotels you might want to try. These Montreal winter hotels are all centrally located and conveniently hooked up to the underground city. For the stylish among you, try Montreal's best boutique hotels. Some offer luxury on a tight budget and others are five-star establishments. Jazz Fest aficionados and anyone else heading to Montreal during its frenzied summer festival season will love these Quartier des Spectacles hotels. They've been handpicked for their high grades with guests and their choice locations in and around the city's entertainment district. And finally, for the ultimate pampering experience, nothing beats Montreal's most luxurious hotels, five-star gems that cater to guests' (and sometimes their pets') every whim. On this list is the "best for families" pick—Intercontinental Montreal with shopping, restaurants, historic attractions, and parks filling the surrounding streets. Kid-friendly activities are organized by this luxury hotel. Get the scoop on each month's average temperatures, precipitation expectations, and wardrobe recommendations. Or go straight to the weather forecast. Plan ahead and it won't matter what it's like out there for your weekend getaway. After all, there's no such thing as bad weather if you dress the part. Every season is different. But Montreal seasons are full of drama. Montreal is a completely different experience depending on the time of year. You don't really know this city until you've experienced every season. Montreal is a fantastic destination for winter getaways. You'll love Montreal in winter. Winter is full of things to do—skating, sledding, skiing and enjoying some winter-oriented epic events. Montreal's "Snow Festival" Fête des Neiges is full of free winter fun. This weekend-only festival is held late January to early February at Montreal's Parc Jean-Drapeau. The park features activities for kids as well as for adults. Each year you'll be treated to ice sculptured playgrounds, a hockey tournament, tubing, sledding, skating, and special events. Every year since 2000, Montréal en Lumière has been lighting up Montreal with free outdoor events, culinary delights, beautiful light shows, and displays throughout the city. In 2019, the event takes place from February 21 to March 3. It's usually held the last two weeks of February. If you are in Montreal on Valentine's Day, make a reservation at one of the city's top romantic restaurants. Spring weekends in Montreal offer an opportunity to start venturing outside. Montreal's Amazing Public Markets are fun to peruse. Find gourmet cheeses at the Marche Atwater and Jean Talon Market is a foodie paradise. In good weather, it can get packed on weekends, though. If the weather turns chilly, head to these Montreal shopping centers. Better yet, go underground. The bulk of Montreal's downtown shopping malls are connected to the Underground City. Stop in and experience a tropical paradise. Thousands of butterflies are unleashed in the Montreal Botanical Garden's climate-controlled greenhouses in late winter through early spring. (Late February to late April). The gardens are beautiful in later spring and are worth a return visit. Montreal really loves St. Patrick's Day and celebrates for an entire week around St. Patrick's Day. While you can do an Irish pub crawl, The Montreal's St. Patrick's Day Parade is worth a weekend trip. It's one of Montreal's most popular events of the year. Catch a show at one of Montreal's major concert venues. Spend the night in a dive bar taking in a live gig. Or dance in one of Montreal's best house clubs. Music lovers will want to head for Montreal in mid-June. Attracting almost one million spectators during the course of 10 days, Les Francofolies de Montréal is the largest French music festival in the world. And then there's the huge Montreal Jazz Festival, the largest jazz festival in the world that takes place late June through early July. Hundreds of indoor shows are complemented by hundreds of free outdoor shows scheduled every day at Place des Festivals, the Jazz Fest's official hub. Take a Sunday stroll in the park and check out Tam Tams, the informal drum and dance fest at Mt. Royal Park. And for something even more completely different, in June, the uncensored performance art festival takes place. Expect anything to happen on stage at the ​Montreal Fringe Festival. Fall is fabulous in Montreal with stunning fall foliage to see along the boulevards and in the many city parks. 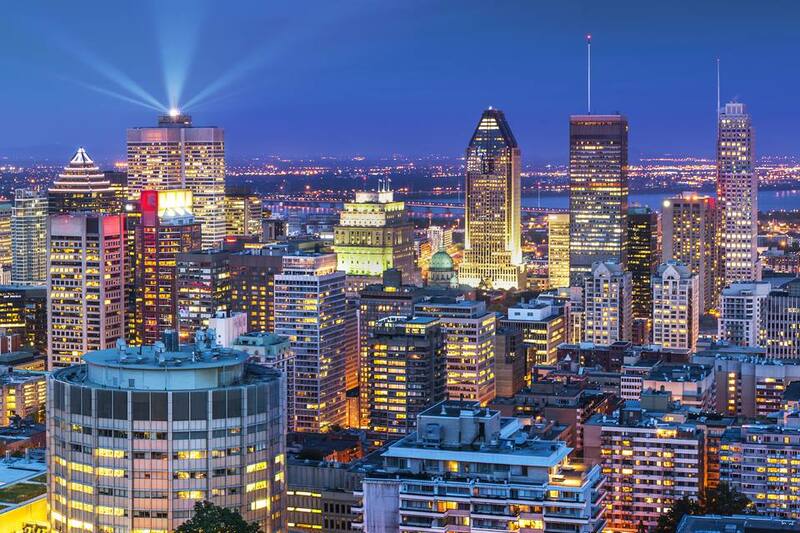 Add to that the fact that some of the most colorful locations are in the middle of Montreal's nightlife, spa, and restaurant scene, and you've got the makings for a wonderful weekend getaway. An annual tradition at the botanical gardens each fall is a spectacular lights and lanterns event called Gardens of Light. You'll wander the lighted paths that feature handmade silk lanterns specially constructed every year in Montreal's sister city of Shanghai. The event begins in early September. Fall is a nice time for a rejuvenation treatment at one of Montreal's top spas. Spend the day in a Nordic spa, saunas, book a massage, get a mani-pedi, and more at these top 12 destinations. Fall is a great time to check out Montreal's restaurants. There are several Montreal restaurant weeks to guide you. And if you're a beer connoisseur, definitely check out these Montreal brewpubs. They make the best craft beer in the city. For some cheap eats and the best bubble tea in the city, head to Chinatown. It's a short walk from the historic center. As for the city's hottest cocktail bars, pubs, and nightlife-oriented bistros, try these destinations listed by neighborhood.